Sometimes its fun to step outside the box and put your scrapbooking skills and supplies to other uses. In this article I will show you how to create a fun and simple magnet for your fridge. To create this magnet you will need a chipboard or coaster flower shape, a chipboard or coaster circle for the middle of your flower, pink patterned paper (I used NRN Designs Inspire Words paper), a pink glitter pen, clear micro beads, a white button, clear liquid glue, clear glitter glue, a nail file, a magnet for the back (I used an old advertisement magnet) and Fancy Pants Frou- Frou Rub-Ons. Cut a piece of your patterned paper slightly larger than your flower. Adhere it to your flower using a liquid glue. Cut away the excess. File down the edges with a nail file. Use a pink glitter pen to outline the edges. Repeat for the to go in the middle of the flower. Coat the flower with clear glitter glue. Leave to dry. Add extra coats if you wish. When dry, adhere your circle to the centre of the flower. Place a large white button in the centre of the circle. 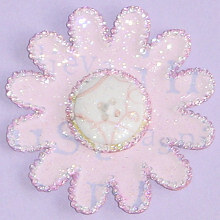 Use pink swirl rub-ons from Fancy Pants Frou- Frou Rub-Ons to decorate the button and then coat with clear glitter glue. Set aside to dry. Using clear liquid glue, adhere clear micro beads around the button and around the edges of the flower. Set aside to dry. Finally, using a strong adhesive, adhere a magnet to the back.